The Dag Hammarskj?ld invert stamp was issued In 1962 by the US Postal Service; one year after the death of Dag Hammarskj?ld, Secretary-General of the United Nations, in an airplane crash. The stamp shows the yellow background inverted relative to the image and text and is also known as the Day's Folly. A total of 40 million of the inverted stamps were printed after the discovery of the error so there would be no rarity factor. One of Britain's postage stamps issued In 1929, this is considered as the most beautiful stamps ever produced. 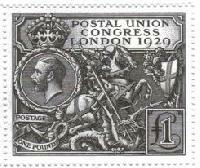 The stamp was designed by Harold Nelson and features the head of King George V and an image of St George and the Dragon. Although the stamp was issued along with four other small format stamps but was highly criticized for its high value of ?1. Issued by the City of Geneva in 1843, the Double Geneva is a rare Swiss stamp making it the third-oldest stamp of the European continent after the Zurich 4 and 6 (1842), and the British Penny Black and Two penny blue, (1840). As the name suggests, It bears the name Double Geneva for the double image on the stamp and its place of origin. It is considered as an extremely rare of all stamps as even its remaining few copies are not known. The Pan-American invert was issued in 1901 in USA during the Pan-American Expo. The stamps were issued with ornate colored frames enclosing a black-and-white image of various means of transportation. The two color printing left the possibility of errors. The stamp contained three denominations, 1 cent, 2 cents and 4 cents, out of which the 1 cent was considerably more common than the others. The India 1947 Aircraft 12 Annas was issued for foreign air mail. This was the third stamp issued by the Government of India on 15 August 1947. A copy of this stamp is found in the catalogue of Commonwealth & British Empire stamps 2008.